With only hours to go before the biggest race of his life, German Fernandez of Riverbank, California, was going stir crazy. He’d been spending long stretches of time in his Greensboro NC hotel room, watching television, munching snacks and needling Johnny Vizcanio, his young track coach. Vizcanio took the good-natured ribbing in stride, but knew his charge needed a release from the monotony. So he and Riverbank cross country coach Bruce Edwards did an unlikely thing with a major race looming on the horizon. They took German to play basketball. Friday afternoon they found a local gym with an open court, starting a friendly shoot-around that developed into several competitive games of HORSE. How many rounds did they play? “I lost at least five,” Edwards said, laughing. Vizcanio figures they played at least eight. In the final matchup, German knocked out both of his coaches, then dispensed with a local teenager by firing a deep jumper for the win. Then he went to the track at North Carolina A & T and took down the entire boys two mile field and Jeff Nelson’s 29 year-old high school record of 8:36.3. Eight excruciating laps on the track, covered in eight minutes and thirty-four seconds, preceded by eight light-hearted games of HORSE spanning an afternoon. That, in part, was how German Fernandez handled the pressure which swirled around this record attempt, and the expectations of a national base of track fans hoping for one more remarkable achievement from this newest American distance star. From the moment the gun sounded, there was no question about the intentions of the four favored runners. Fernandez, Luke Puskedra UT, Colby Lowe TX and Rob Finnerty MN charged rapidly to the front, creating nearly instant separation from a chase pack led by Sean Keveran TN. 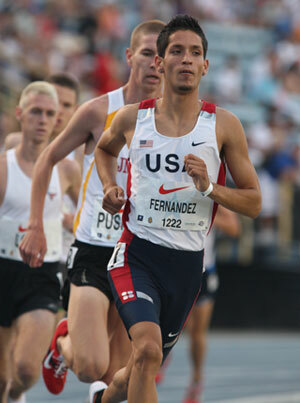 Wearing a Team USA uniform from his trip to the World Junior Cross Country Championships, and the number 7 on his hip, Fernandez looked calm but resolute as he surged to the fore whenever the pace lagged, bearing down on a series of quarter mile splits etched into his memory. The fractions for the first mile were 64.2, 2:10, 3:14.9 and 4:19.4…clockings which fit within the range Fernandez and his coaches had discussed. Puskedra, known for his affinity to lead races and respected for his racing grit, seemed to be slightly over his head in this metronomic attack on the 8:36 mark. He battled gamely early, fronting Fernandez and running shoulder-to-shoulder several times, but his maneuvers only appeared to obstruct Fernandez’ relentless pursuit. Each time he sensed a lull, Fernandez simply bolted past the lanky Puskedra to resume the daunting pace. Puskedra and Lowe hung tough (right, photo by Vic Sailer), but eventually both fell off the back. When Fernandez passed the mile in 4:19, he lowered his head slightly and bore down even harder. After the next circuit in 63.9, it was clear Puskedra was suffering and Fernandez was chasing bigger game than the national title. Two laps later (64.7 and 63.3), Fernandez was suffering as well. He cracked what appeared to be a smile with a lap to go, but after the race he was quick to clarify the expression as more of a grimace. With the record hanging in the balance, Fernandez took his fluid stride into the final lap. His coaches, however, were noticing the tell-tale signs of depletion. His arms were creeping upwards and his head was thrust back slightly, chin to the sky. With the grandstand in full-throated support and a who’s-who of track cognoscenti crowding the infield sidelines, Fernandez barreled home toward history, stopping the clock at 8:34.40. Behind him, Puskedra barely held off Lowe for second, 8:47.06 to 8:47.07, while Rob Finnerty (8:50.96) and Kevin Williams CO (8:51.30) recorded massive PRs in the wake of the national record. The finish line area was littered with bodies ruined by the effort of pursuing Fernandez, while the star of the night spun on wobbly legs, poured a cup of water over his head and took in the adulation. With Jeff Nelson’s record relegated to second-line status on the all-time list, the question naturally arose: How did Fernandez handle the rampant expectations surrounding this event? The lack of attention to the pre-race buildup did nothing to dampen the appreciation Fernandez had for the enormity of what he’d just accomplished. Or the difficulties inherent to the task. High expectations and internet hype weren’t the only things Fernandez and his mentors had to ignore. There was no shortage of armchair coaches around the country questioning the approach Edwards and Vizcanio were taking with their athlete, known for a history of injuries. The spring season was punctuated by a series of doubles and triples at league and conference meets, all of which had critics questioning the wisdom of high-level efforts at low-level events. Edwards was unfazed and unmoved by the second-guessing. The 'California double' or the two mile record? It was at that California state track meet (left, photo by Kirby Lee) where the wisdom of the Riverbank coaches was finally on full display. Fernandez tore through the 1600 final in 4:00.29, then returned two and a half hours later and ran a national 3200 record of 8:34.23. 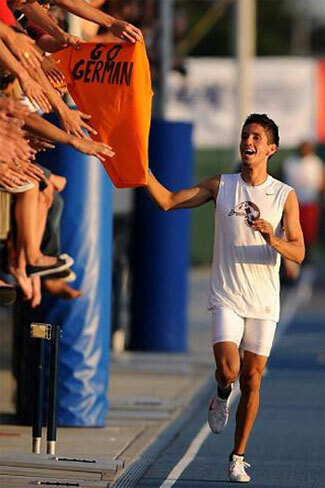 Even after Friday’s two mile triumph, Vizcanio considers "The Double" to be Fernandez’ greatest accomplishment. Nonetheless, the two mile record was a massive achievement, although hardly a foregone conclusion given Fernandez’ inauspicious beginnings as a runner. That love was obvious in the moments after the race, as Fernandez posed by his record mark on the trackside clock, and then moved from one polite interview to the next, fielding questions graciously while talking excitedly about the future.